Cheshire comes out on top with 1.67 Obama/Biden votes for every 1 Romney/Ryan Vote*. Grafton is close second at 1.64. Obama lost Carroll, Rockingham and Belknap. * Must be due to our diverse urban environment over here. What… Keene does have a 93rd Street don’t you know. Despite GOP efforts to make voting extra hard, it looks like we exceeded 2008 turn-out by 2 votes! NH Senate GOP loses popular vote, maintains majority? We have our own version of the ‘Electoral College’ problem here in the granite state.. at least for the next 8 years. It looks even worse when you consider that the GOP was able to score 18,644 “unanswered” votes in Bragdon’s District 11. Remove that race and the Dem Team builds a 36,261 vote margin or 53% of the state wide vote but do not even have parity rule in the body. That is why I was happy to hear that Lee Nyquist requested a recount in his close race in District 9 (happening now). Sanborn won this wandering district by just 253 votes 8/10th of 1%. With parity in the Senate in the balance it’s worth the review. Close races are not bad, but when they are the result of “creative districting” that disrespects communities of interest as egregiously as NH-9 does we should all take note and and try to do better when the opportunity arises again after the 2020 census. Based on our current Senate districts NH Dems may need to get used to winning popular vote totals while remaining in the minority in the NH Senate Chambers. 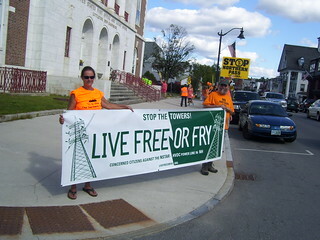 In a big show of solidarity, folks who live in areas that will be affected by the Northern Pass project joined in a series of protests throughout the day. There were actions in Hill, Manchester, Holderness, Farmington, Lancaster, Sugar Hill/Easton, Littleton, Deerfield and Colebrook. There were 200 protesters in Colebrook, and Rep. Charlie Bass was on hand, as was Executive Councilor Ray Burton. WMUR covered the Manchester group, and NHPR was in Sugar Hill. I was in Littleton, where about 40 people of all ages gathered. Orange shirts were worn, songs were sung, and there was a lot of support from folks driving by. Opposition to Northern Pass transcends the usual divides of income and political ideology. What have your hands been up to this Labor Day weekend?